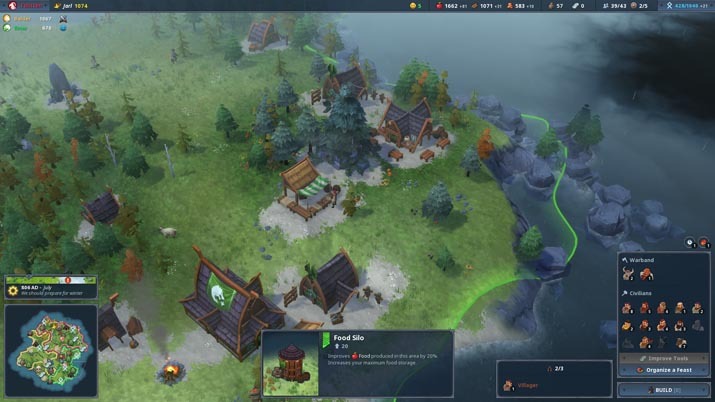 Northgard is an empire-building game where you compete with other clans; ultimately it’s reminiscent of the Age of Empires series, but with the incorporation of Norse mythology. At the time of writing, you can only choose single player – multiplayer and campaign modes are not yet available. Nor is there a tutorial, besides some randomly granted hints, depending on what you are doing. Playing the game is straightforward, but learning and mastering the strategy is a challenge of its own, and requires planning, trial and error, and preparing for the worst. Moreover, there are currently only three different clans (with more to come), but each has two starting bonuses and two fame bonuses, and each clan caters to a different play style (for instance, one buffs attack, while another will provide extra starting resources). Particularly with random events, such as earthquakes that damage various buildings and set them aflame, or rats that threaten to devour your food supply. You must also account for the seasonal progression, changes in weather, and unhappiness, which prevents new villagers from joining, stagnating your otherwise budding clan. As would be expected in real life, resource production decreases during the winter; you must always stock wood before winter to stave off the cold harshness and looming devastation that could befall your clan. Even during April, the in-game calendar advises preparing for winter. I did not heed this warning, and during the brutal wintry season, my wood supply was reduced to nothing, resulting in my clan freezing and subsequently becoming sick. More than half of them died. This halted the expansion of my clan and put a hiatus on taking over the surrounding territories for several months. On another playthrough, after two disastrous events—the earthquake and the rats, which ate 80% of my food—my supplies quickly diminished; I felt as if I was drowning from the unrelenting pace, and that my clan would be eventually swept away with the passage of time. During winter, I did not have enough wood to build another woodcutter's lodge to increase wood production, (building upkeep created a negative balance of wood); my previous lodge was full already, as you can only assign two villagers without upgrading the building – which requires wood. All I could do was watch, and hope for the best; luckily, the winter gave way to spring, and I could slowly, but surely, build my supplies back up again. All this in just a matter of twenty-five minutes. The rate at which the time progresses is a bit quick—approximately ten minutes for each year. If there was a way to slow down the time to a more reasonable and manageable pace, one might not feel as overwhelmed. 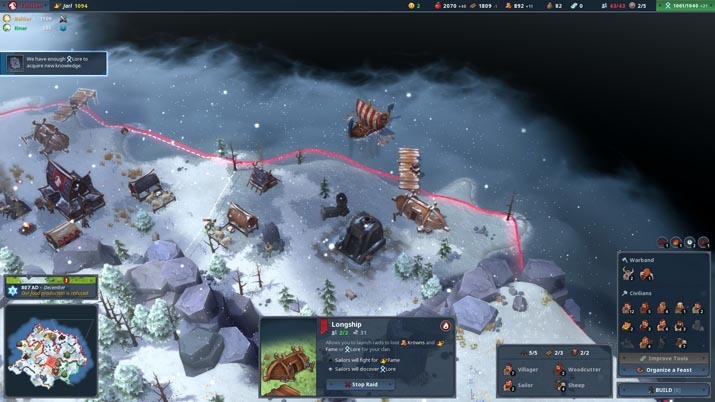 Northgard goes fast, as do your supplies: make sure you are ready for the worst when it hits. There is a form of XP (Lore) that accumulates over time, but conquering certain locations inhabited by monstrous creatures allows access to runestones, whence you can recruit loremasters, who steadily increase this value. One can also construct a carved stone for this purpose. At each "level up," or when Lore reaches a certain amount, one can choose an unlock to further benefit the clan. These range from increased resource production, to more military-based upgrades, to various other resource or trading benefits, and, after so many unlocks, even blessings from some of the Norse deities. This mythological infusion helps define Northgard. One can also play with no AI clans, creating a more PvE experience (whether it be the weather, monsters, disasters, or a combination of these three), and allowing for more focus on overall strategy and exploring the world without having to worry about rivals. In this setting, there are still areas to conquer, an army to build up, and attacks on enemy groups of monsters to eradicate. In fact, at times, these monsters will attempt to take over your territory, and your army will have to fend off the attack. Graphics are fantastic—the rocks especially, while not necessarily realistic, are well done nevertheless. The music randomly cuts out, then returns several minutes later. The world feels empty without the soundtrack to fill in the gaps between the occasional grunts one's clan members make. Additionally, each map is randomly generated, which makes each play unique and provides its own set of challenges; however, you can’t change the size of the map or how abundant resources will be. 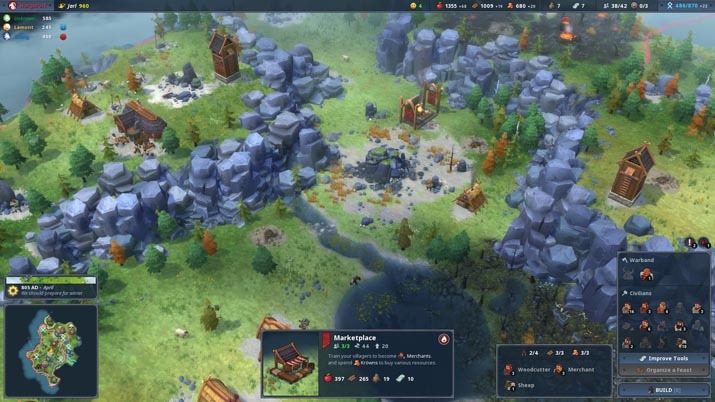 For what Northgard sets out to do, it does well, and with the content that is soon to come, the title is promising and worth getting at its price point, especially for those who enjoy empire-building titles. One may, however, be dismayed by the fact that there are not that many buildings to construct (there is a lack of a stable, for instance), but given the relatively quick gameplay, this may not be entirely necessary. With the option of no AI clans, for a more PvE-style gameplay, there is some range of playability available to you. There is a bit of luck involved, as some disasters are harsher than others; when an earthquake hits, it could affect none of your buildings, or nearly half of them. The moments of relentless challenge, however, may be a turn-off for players who are looking for a perhaps more casual experience. But, for those who love the tension, suspense, and the struggle to develop the perfect strategy for a fierce and resilient empire that can dominate the world – this may be your game.